SU9061 8216. 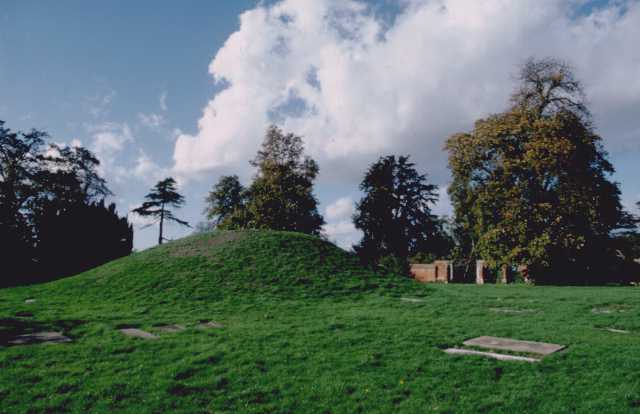 Taeppa’s Low, a man-made burial mound or tumulus stands in the grounds of Taplow Court to the west of the village of Taplow, 1 mile east of Maidenhead, and to the north of the A4 and just east of the A4094 road. The site is close to the east bank of the River Thames. The Anglo-Saxon burial mound stands inside an old churchyard where there stood, upto 100 years ago, a Saxon church dating from c700 AD. The whole site is surrounded by the earthworks of an Iron-Age fortification which are now barely noticeable to visitors. The grass-covered mound is 15 feet (4.5 metres) high and 80 feet (24 metres) in diameter at its base with a flatish top to it. In 1883 an archaeological excavation was carried out by the parish clerk who just so happened to be an antiquarian. He dug down into the mound for a few feet but nothing much was found; however, when a 6 foot hole was dug into the mound just below ground level, a burial was found. The funery finds consisted of a thigh bone and vertebrae inside a planked coffin in a pit with a gravel floor. The grave pit or chamber was 12 foot by 8 foot and was made out of timber. Along with the bones of Taeppa were his many grave goods, some quite rich and decorated, indicating that he was a person of noble lineage – probably a chieftain or prince. He may have been a relative of King Redwald of East Anglia who died in 617 or 625 AD and was buried at Sutton Hoo. The finds at Taeppa Low were dated to 620 AD. Among the artefacts found during the excavation was a sword, spear, shields, gold buckle, bronze clasps, drinking horns with gilt ends, glass beakers, an Egyptian bronze bowl, drinking cups, fragments of a harp, some well-decayed cloth found on the bones and golden thread from his tunic – everything that he would need in the afterlife! These finds are now in the British Museum, London. We do not, however, know whether or not Taeppa was a Christian, certainly his relation King Redwald was an “on off Christian”, and this was before the area was Christianised by St Birinus twenty years later. 200 yards to the north-west of the mound is Bapsey Pond which is actually a holy well associated with St Birinus, bishop of Dorchester, who died in 650 AD. He baptised many converts at the well in 642 AD. The source of the pond comes from the old churchyard where the mound is located. So, maybe there were originally two holy wells here? Taplow Mound, Buckinghamshire. Image copyright Bob Trubshaw / bobtrubs@indigogroup.co.uk. From At the Edge / Bob Trubshaw 1996. Categories: Artificial / Man Made Mounds, Taeppa's Low | Tags: Taeppa's Low at Taplow in Buckinghamshire | Permalink.